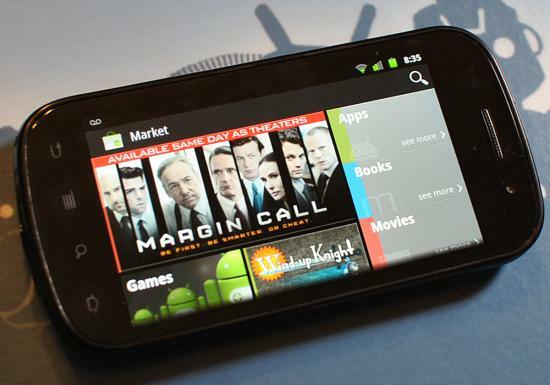 Here’s the latest version of the Android Market. Looks mostly like the Android Market you have now, but it’s not. It’s better. It’s newer. And therefore better. And a fun fact about the Android Market: Once one person gets it, it can be pulled from the phone and shared. And that’s what we’ve got here. So what’s better and newer in Build 3.3.11, you ask? So far as we can tell, it’s mainly in the settings. You now have the option to tell all of your apps to automatically update, instead of checking a box on each on individually. (Bugdroid be praised for that one.) You can also tell the Market app to only update applications when you’re connected to Wifi. Again, a good one. And you can have it automatically add shortcuts to your homescreen, if you’re into that. There are a few UI tweaks, too. Nothing major. There’s also some legalese regarding open-source licenses, which makes Jerry happy. You can download it now, or just hang out and it’ll push to you (assuming this isn’t just a test build) when the time is right. Do note that apparently it’s not playing nicely with Honeycomb tablets, and we’re not exactly seeing our inbox clogged with people saying they’ve gotten this build (which is what usually happens). So if you sit this one out, we won’t blame you one bit. Full description for the app can be found at http://bit.ly/9yd64W Please contact support@airkast.com with issues.